Latin music superstar Juanes has written an original song titled “Juntos (Together)” specifically for Disney’s “McFarland, USA,” which he recorded for the end title track of the movie. 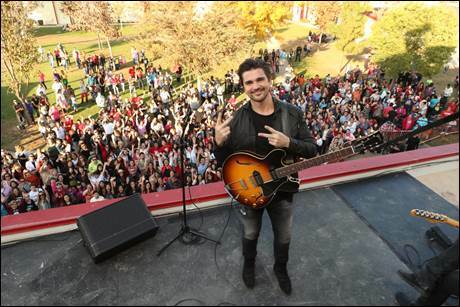 The day after learning he is once again a current GRAMMY® nominee, Juanes traveled to McFarland, California, this past weekend to film a music video of “Juntos (Together)” on location—drawing a huge crowd of fans excited to get a glimpse of the chart-topping music star. With seven solo albums to his credit and multi-platinum sales of over 16 million copies, Juanes is the world’s leading all-Spanish language rock artist–both a 2-time GRAMMY® and 20-time LATIN GRAMMY® winner with nine #1 singles on Billboard’s Latin Singles charts. Working with famed rock producer Steve Lillywhite, Juanes’ latest album “Loco De Amor” was released in the spring of 2014 and debuted at #1 on Billboard’s Latin Pop Albums chart and topped iTunes sales in over a dozen countries. Juanes is also frequently recognized as one of the Spanish-speaking world’s leading social media voices with an online following of over 18 million fans. The Colombian superstar’s dedication as a global activist also extends far beyond his passionate lyrics and is seen in his wide ranging charitable work for his own Mi Sangre Foundation and as a co-founder of the “Paz sin Fronteras” (Peace Without Borders) organization.